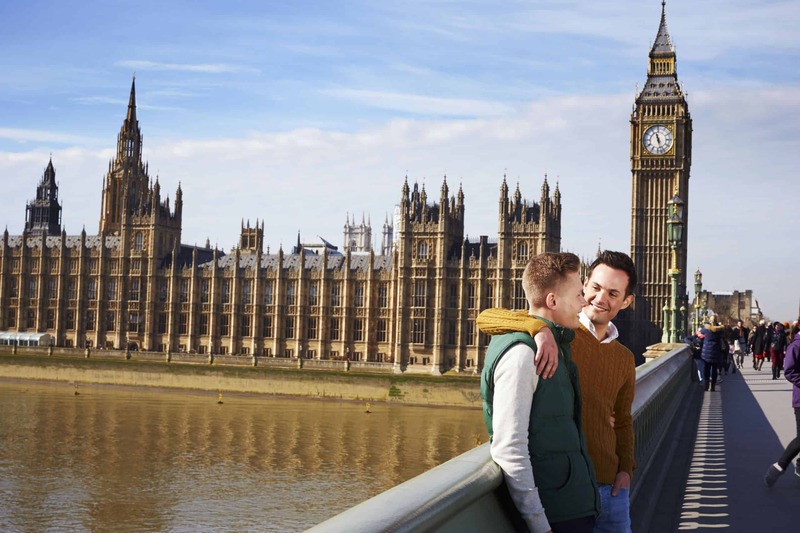 This gay group trip takes you through the north, south, east and west of England taking in all of the most beautiful and historic sites that make the United Kingdom such a magical place to visit. 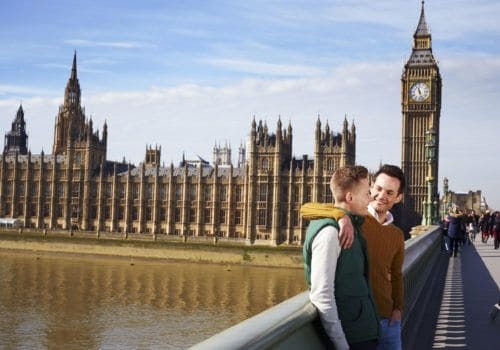 Full of medieval castles, centuries-old manor houses, classic British countryside, ancient ruins and more, this gay vacation tour allows you to step back in time, soak up the British culture, and learn all about the history from the prehistoric ages to the modern day. Today you’ll arrive in London where you’ll make your way to the Amba Hotel Charing Cross. You’ll have most of the day at leisure to rest from your flight before meeting the rest of your fellow travellers and tour guide in the evening at your welcome dinner and orientation. After enjoying a lovely breakfast you will be driven to Windsor where you will take in both Windsor Castle and Windsor town. Windsor Castle is the largest inhabited castle in the world and is one of the Queen’s main residencies, waving the Royal Standard flag whenever she’s at home. It was originally established by William the Conqueror in 1080 and has been added to by successive monarchs over the centuries to what it is today. Windsor itself is a scenic little town full of expensive boutiques, cute little cafes, numerous antique centres and art galleries. Overnight in London. After enjoying your breakfast you will depart for the mysterious landmark of Stonehenge – an ancient, pre-historic monument shrouded in mystery, the function of which is still unknown to this day. After taking a look around Stonehenge, you will continue your journey onto Cheltenham where we’ll spend the night. Today we’ll have a guided tour of Bath, one of the most attractive cities in England. It was the home of Jane Austen, a writer so iconic her likeness is now featured alongside the Queen on the ten-pound note. You’ll also visit Bath’s famous Roman Baths and catch a glimpse of England before it was England. After lunch we’ll visit the village of Bibury in the Cotswolds. Today you’ll visit the birthplace of the world-famous author, poet, playwright and author William Shakespeare – Stratford-Upon-Avon. You’ll enjoy a guided tour of this charming, old-world town which will take in William Shakespeare’s birthplace, Anne Hathaway’s cottage as well as William’s burial place at Trinity Church. Today we’ll visit the home of the Dukes of Devonshire, Chatsworth House, one of England’s great stately homes. We’ll visit the famous rock garden built by Joseph Paxton in the 19th-century. Returning to Chester, we’ll visit Biddulph Grange, the beautiful Victorian garden. Here you’ll find plants from all over the world, including England’s oldest golden larch. Today we’ll visit the walled city of York. It’s home to the Shambles, Europe’s best preserved Medieval Street, and York Minster, one of the world’s great cathedrals. You can also walk around the city’s famous walls. These walls defended York from Oliver Cromwell’s army during the English Civil War. This morning we’ll visit Castle Howard, home of the Howard family. It boasts Capability Brown gardens and some great artworks. We’ll then travel to the coastal town of Whitby, the inspiration for Bram Stoker’s Dracula and home of legendary fish & chip shop, The Magpie. This morning we’ll head to Sandringham Estate, one of the Queen’s country retreats. Set in 24 acres of grounds, this has been a royal residence since 1862. We’ll then head to the university city of Cambridge. Today you’ll enjoy a morning tour to the former home of the celebrated British author Beatrix Potter, as well as the popular poet William Wordsworth’s former cottage, learning all about the lives of these fascinating, creative icons. From here you’ll continue on to Durham, crossing the Pennines mountain range en route and stopping off at Raby Castle on the way which is considered one of the finest medieval castles in the country dating back to the 14th century. You’ll enjoy a tour of the castle and its lovely gardens before finally arriving in Durham where you’ll visit the impressive Durham Cathedral and have some free time to explore the city. Tonight you’ll stay in the amazing Lumley Castle Hotel which is housed in a 14th-century castle overlooking the River Wear. Today marks the end of your journey. You’ll make your way to London ready to catch your departing flight home.